One common problem faced by many Nitro vehicle owners, is a flooded engine. Although we hate to admit it, there is a good chance that this will happen to you at least once during your RC career. During a routine startup, it is not uncommon to have the engine "lock up." Although alarming at first, more often than not, the nitro engine may just have become flooded with too much fuel during the startup process. Luckily, this is a relatively simple fix. Clearing the engine can be a painless process if you follow these quick and easy steps. Typically, when an engine becomes flooded, it will experience difficulty starting. 4. Your engine is now ready to start. 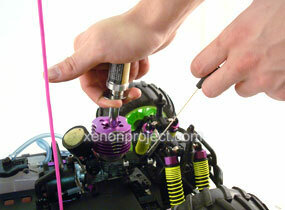 It is no longer necessary to prime the engine, as it may already contain some fuel residue.